A new film is challenging the way people think about vegan lifestyles. Vegucated is a documentary following three omnivores who have agreed to adopt a vegan diet for six weeks in hopes of gaining a healthier lifestyle. Three New Yorkers, all from different backgrounds, experience different challenges in adopting a healthier lifestyle. The film is a sociological experiment, science class, and adventure story all rolled into one. It was recently named “Best Documentary” at the Toronto Indie Film Fest, and won the “Chris Award” at the Columbus International Film & Video Festival. 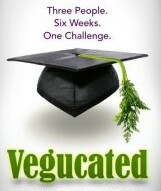 Vegucated will be touring the country this fall, with showings all over the United States. The U.S. premier will be this Thursday, October 13, at the SVA Theatre in New York City. The Midwest Premiere will occur at the University of Central Missouri, Saturday, October 15th. The Texas Premiere will be during the 2011 Texas State Veggie Fair on October 22nd at The Texas Theatre in Oak Cliff Texas! The film will be touring through the end of November, with stops ranging from Missouri to Los Angeles. For more Vegucated tour stops visit their website!